Never heard of disc golf? Well, you're probably not alone. Disc golf is a sport that utilises the rules of traditional golf but replaces golf balls and clubs with a flying golf disc. 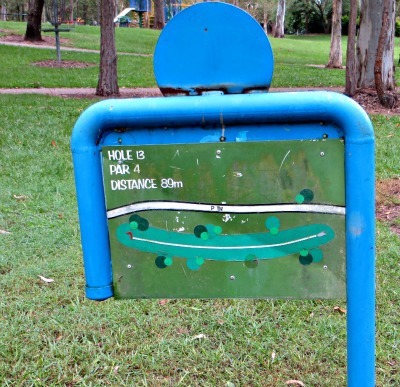 A few Brisbane parks have disc golf courses set up including John Bray Park, which provides an eighteen-hole course for participants. Starting from the concreted tee off area, competitors are required to land their golf disc in the designated basket. The person who can do this in the least number of shots will be declared the winner. At each tee off area there is a map to direct you down the fairway to the basket, and to show relevant landmarks such as trees and paths. Out of bounds areas are also shown. The baskets are fairly easily spotted as they are rather odd looking metal poles sticking up out of the ground with a tray and metal chains attached. Shots must be taken from where the disc lands. A one shot penalty will apply if you are unable to take your shot from an out of bounds area and are forced to move to the closest in bounds area. The professional disc golf association outlines the official rules on their website. Just like traditional golf, disc golf offers the challenge of playing to the weather conditions. Each hole has a par listed so that you can try to finish under par or improve with practice. For the serious disc golfer there is even a range of discs to choose from depending on what type of shot is required. 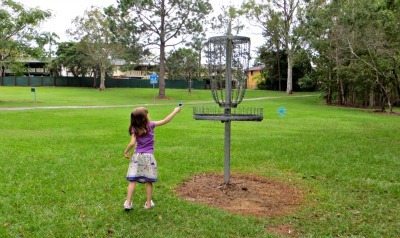 However, unlike traditional golf, disc golf is far more accessible. There are no course fees, no club fees, no bookings required, no expensive equipment or shoes to buy, and is great fun for all ages and abilities. Think you can make par four while avoiding the obstacles? While there is a special disc to be used for this sport which looks a bit like a flat rubber record, we've mostly used a flying Frisbee whenever we have played. The last time we played on this disc golf course the kids decided to use a flying spinning toy instead. Even though we weren't officially playing the sport of disc golf, we were all still having plenty of fun. The John Bray park disc golf course is unfortunately starting to show its age. The numbers have faded from the top of the baskets and some of the maps have been damaged, making it occasionally difficult to figure out where you should be aiming. Although with a little restoration it could easily be returned to its former glory. A detailed map of the course is available to help and can be found here. The park itself is in a natural bushland setting, providing plenty of shade, winding pathways, playgrounds, shelters and wildlife to admire. Landing a hole in one on this course seems to be fairly difficult due to the wooded nature of the park. There has rarely been anyone else playing when we have visited this park so it is doubtful that you would ever have a problem using the course. Tournaments are organised a few times throughout the year by Moreton Bay regional council and the Queensland ultimate disc association so these may be the only times you would find it difficult to play on the course. A calendar of upcoming QUDA tournaments can be found here. 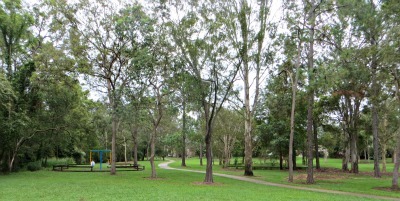 John Bray Park, as the name would suggest, is located in Bray Park. When looking for the disc golf course simply head to the main section of the park on Kensington way. Parking is available in the Kensington Village shopping centre complex opposite the park, street parking is best on Clifford street, or near the soccer fields on Samsonvale road. Remember to pack your golf disc/Frisbee/flying spinning toy and a pen and paper for scoring. Hats and sunscreen are a must along with insect repellent as there are often mosquitoes near the creek that runs through the park. So the next time you're looking for an excuse to get outdoors, challenge yourself to a round of disc golf at John Bray Park. hi Katie...great article, good to see people out. QUDA plays only a small part in running any events at the course, it is myself and the other members of the Brisbane Disc Golf Club that run events in South East Queensland. The general public is always welcome to come to these events and we look forward to seeing anyone and veryone looking to throw a disc! 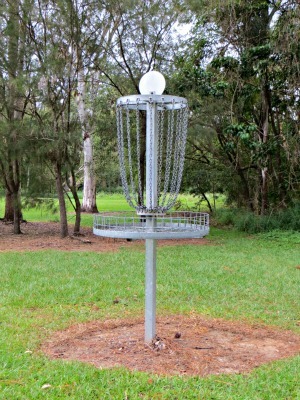 https://www.facebook.com/BrisbaneDiscGolfClub is where you can find us. We also hosted the Australian Disc Golf Championships at Pine Rivers Park this past November. That week we also helped out at the councils inter-school event which took place at Bray, with a number of local schools. hope to see you out there some time!